Magic is an ever-changing game, especially in Limited formats. Each Draft or Sealed Deck you do is different from the last, but that doesn't mean that you won't run out of content eventually. While many of our most diehard fans will do 20, 50, or even a hundred drafts of a given format, eventually they will tire of it. Fortunately, we add new Limited formats at a pretty fast pace, so we can keep up with our players' voracious appetite for new content—assuming that the new content has not only enough new cards, but also new ideas and strategies to explore. That's a large part of why it is important for Limited environments to feel different from each other. If the new Limited environment felt just like the old one, but with new card names, that would be bad. People would start to get bored, and they would no longer have fun. That drive to discover new things would be gone, as the things to discover would be the same things you discovered the last time. It's important for us to make sure that our Limited environments feel different from one another, both between what the cards and mechanics do, and also within the structure of the set. Today, I want to talk about a few of the things that we do to help separate Limited environments from each other, and the tools we have to make each one function as its own entity. This is probably the most basic thing, but also one of the easiest to overlook. 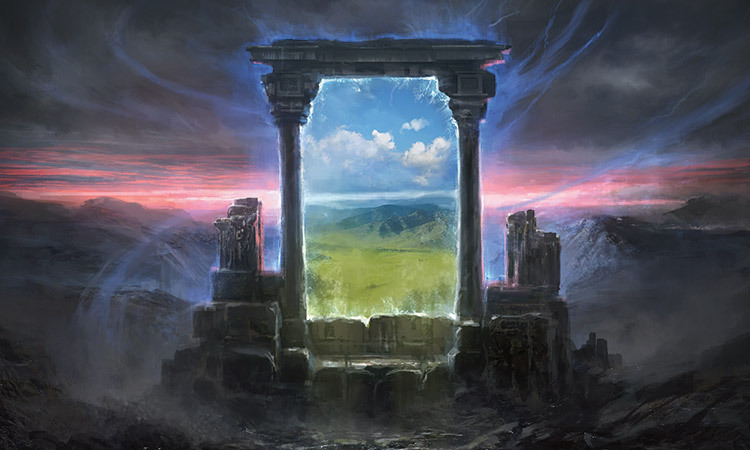 The necessity behind Magic's mana system, as well as color screw and mana problems, is often seen as a huge flaw, but it is a huge resource for creating fun Limited environments. If players were able to take the best card in every pack, the environment would be very hard to balance. Instead, we dictate how much players can stretch their mana base for removal, bombs, and evasive creatures by deciding how much mana fixing exists in an environment. The simplest version of this is for multicolor blocks like Khans of Tarkir. That block had tons of mana fixing, a cycle of ten common lands, five uncommon lands, five common artifacts, and even more within the rest of the cards at all rarities. They took up a lot of space, both in packs and in people's decks. If people wanted to play a five-color deck with a slow and inconsistent mana base, they could. You could also play a blisteringly fast deck that ignored the mana problems and went for consistency. This was a huge question for that format, and led to a lot of its depth. Magic Origins is a Limited environment with almost no mana fixing. This was a deliberate change to make it feel different from Khans. While you certainly can play a five-color deck if you want, you will find very little in the way of support to get you there. Sure, you can play four Evolving Wilds if you open that many, but it's not going to do a lot for you. The format is deliberately trying to push people into one- or two-color decks, and the way to do that is to eliminate easy mana fixing. One of Avacyn Restored's largest flaws was there were just not enough ways to kill creatures. There were two enchantments that gave -1 toughness, plus Pillar of Flame, Death Wind, and Bone Splinters. In terms of conditional removal spells, it was very hard to deal with anything that had 3 toughness. This made a soulbonded Trusted Forcemage much harder to get off the field. Having a different number that is the "safe" toughness for creatures is important. If no number is safe, then the removal is probably so expensive that it won't do much in the format. If the number is too low, then it may be impossible for most decks to deal with a bomb, which is also not a good spot to be in. What we generally want to do is have formats where the important toughness is either 4 or 5, and build our commons around that. It lets us print a wide variety of removal spells, and give players one that will kill almost anything. For example, Magic Origins has common red spells that deal 1, 2, and 3 damage, as well as a common black spell that kills a creature with power 3 or less. 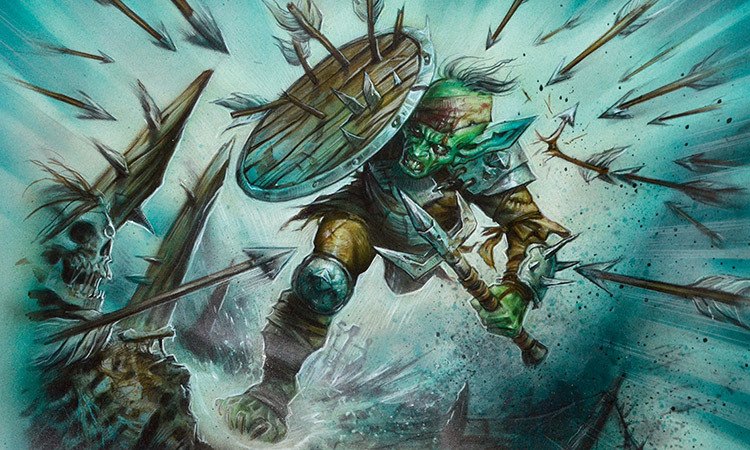 Green's fight card is +2/+2 (meaning it can easily deal with a 4 or 5 toughness creature). Red has Fiery Conclusion at uncommon, which deals 5 damage. Black has Eyeblight's End, which also deals with small creatures. There is a big power bump at 4 toughness (especially if it has 4 power as well) that makes cards like Rhox Maulers so hard to deal with. What's more with the Maulers, once it becomes renowned, it quickly turns off Fiery Conclusion and most uses of Wild Instincts as removal. If the removal at common was in a different space, we might have had to make the Maulers a 4/5 to get the same effect of having a good common creature that could be ramped into for a nice effect. At the same time, part of what lets us create higher casting cost creatures that are impactful is including cheap removal that misses those creatures. There is still removal in the set that will kill a renowned Rhox Maulers or Sentinel of the Eternal Watch, but it is generally more expensive—so you can't load your deck with it. This gives decks that want to go long a creature that can be resilient against some removal-heavy decks, ideally without ruining every game where the creature hits the board. White and blue have good answers, but those same cards have a few weaknesses with cards like Fleshbag Marauder in the format. There is no doubt that Origins is a fast Limited format. That was intentional, as a lot of the flavor of the set was based around renown, and it was important to make sure the mechanic mattered. That meant putting it on creatures that were pretty aggressive, to make sure that there would be enough games that were about the key mechanic of the set. It was also made faster as a change of pace from Khans block, which we identified as being pretty slow due to the prevalence of multicolored cards, Dragons, and morph. The truth is there isn't one speed that is right for all games of Magic. Some people like fast formats, and some people like slow formats. Each one has advantages and disadvantages, and it is up to development to provide a healthy mix of formats, as well as ways for every format to have fast and slow decks. If you look at formats like the aforementioned Khans, Shards of Alara, or Ravnica and Return to Ravnica, they tend to be a little slower because they are all about multicolored cards. We are encouraging players to play multicolored decks, and need to give them time to develop, so we tend to make the formats have fewer strong low-drops. We want enough that it isn't always right to go three or more colors, but not so much that you can't do the thing the format is about. Other sets, such as Shadowmoor, Origins, and Zendikar, led to fast formats, and they tended to be based around mechanics that encouraged aggression. One of the major goals for development is to deliver on the experience that design has put together for a set, and a large part of accomplishing that in Limited stems from making the format the right speed to ensure the experience plays out. Design playtests are very useful, but the designers are often going out of their way to try and make sure the right things matter in their games—either building decks that don't reflect what people in the real world would build, or ending up with cards that are stronger (and often more swingy) than is usually fun for Limited environments that are meant to be played over and over again. A big part of translating what the designers want to see into a set that the developers enjoy is getting the format to function at a speed where competitive play works. In the earlier example of Magic Origins, I decided to make the format a little more on the fast side so that forcing through renown creatures using combat tricks and cards like Stratus Walk was fun, but could be done without ending the game over the second one creature hit. I could've made the creatures higher on the curve and easier to get through, or given them a bigger swing, but I found that designers liked being rewarded for getting renowned—and getting one creature renowned didn't just win them the game. Finding the right balance in the format to let the leveling up over time matter was my way of trying to get the thing development found fun to work in the real world. I don't mean this as a tease, since I can't go deep into what the plans are for the future, but we have a better idea now than in the past about what to do with second sets, largely because they are now the ends of blocks. In the past, there was a delicate balancing act of trying to add enough new things to make the Draft environment feel new, while leaving enough in the queue for the third set—which often just had a huge mechanical shift anyway. In the new world where we don't have to hold anything back, we are much more free to explore both new mechanics and the natural limits of what we want mechanics to do in the block environment. I believe that if we were doing Theros now, in the two-block model instead of in the three-block model, we would've had more enchantments in the first set and bigger enchantment rewards in the second set. As we get closer to the release of "Sweat," the second set in the Battle for Zendikar block, I will be able to talk more about what our plans are and use better examples based off of the mechanics in BFZ. That's it for this week. Join me next time for Vorthos Week, as I take some time to discuss flavor.